Despite some profit taking from US dollar long positions yesterday, which have been profitable lately on the back of a resurgent greenback, all indications are that the only way for the Australian dollar is for it to go lower than where it is, even allowing for its recent fall. The major mover of any currency is the differential in the core interest rate of the country to which it belongs against those of its global counterparts. There is no sign of any attempt by the Reserve bank of Australia to push up rates to meet the expected rise in the USA. This will tend to remove the status of a high-yielding currency from the Aussie. The only consideration that has prevented an even lower interest rate in Australia is a fear of a property bubble, and now there are moves afoot to being in so-called macro-prudential policies that would artificially restrict borrowing for property purposes, especially by investors. A major factor is the price of Iron Ore, a very important export for Australia. The fall in the price of this commodity is accelerating. This is because of, as previously noted (Australian miners play hardball), the efforts of large scale miners to reduce competition by means of a price war, allied to a drop in demand. But now there is another factor in play. A Brazilian mining company, Vale, has built a number of extremely large bulk carriers which have the capability, if they can resolve docking issues in China, of further reducing the price of Iron Ore from South America, which hitherto had been kept relatively high by shipping costs. And then there is the Reserve Bank of Australia (RBA) itself. Central bankers do not always get what they desire in terms of the value of their currencies, but they do have options open to them and the fact the RBA wants a reduction in the value of the Aussie has to be taken into account. In its statement following its decision to keep interest rates unchanged last night (GMT terms), it reiterated that the exchange rate remains high by historical standards, “…particularly given the further declines in key commodity prices in recent months”. This was even as they acknowledged the recent fall in the currency. Currency pairs do not travel in a straight line in terms of their exchange rates. 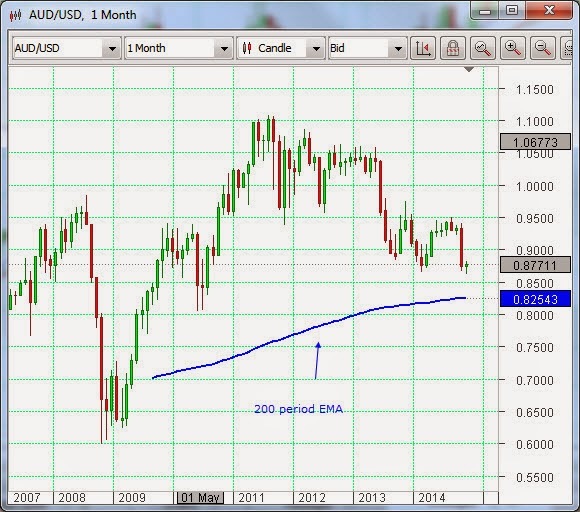 However, the general trajectory of the Australian dollar against its major counterparts is resolutely down.